Cake Beauty, launches be Delectable, a luscious new five-piece body collection that mixes wholesome natural ingredients with four delicious fragrances – all in fun, whimsical packaging. Developed with indulgence in mind, be Delectable includes a nourishing hand cream, a unique hair and body mist, body wash, body polish and body lotion. Each product comes in four “delectable” scents: strawberry & cream, lemon & cream, coconut & cream, and vanilla & cream. be Delectable contains up to 95% transformative natural ingredients, such as coconut oil (cold-pressed for unmatched hydration and anti-aging benefits), aloe vera (for deep soothing and hydration) and shea butter (renowned for its ability to moisturize and condition). 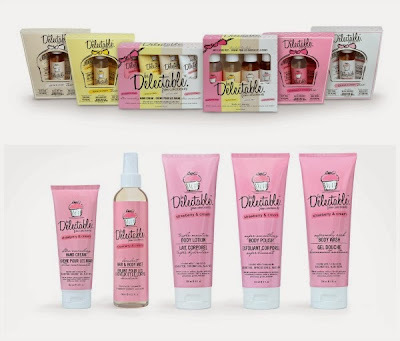 The full collection of be Delectable products is formulated entirely free of parabens, sodium chloride, phthalates, GMO’s, mineral oil, petrolatum, gluten and triclosan – and is not tested on animals. Ultra nourishing hand cream ($10): Give hard-working hands a well-deserved treat with this ultra-nourishing hand cream enriched with shea butter, coconut oil and aloe vera. Decadent hair & body mist ($10): Perfectly balanced, this sumptuous mist infused with aloe vera lasts all day without being overwhelming. Used at home or on the go, hair and body smell fresh and clean all day long. Supremely rich body wash ($10): A luxurious blend of creamy bubbles infused with coconut oil and aloe vera nourishes, hydrates and softens. Super smoothing body polish ($14): This super smoothing body polish is made with coconut oil and aloe vera for hydration and moisture and fine apricot shells to gently scrub away dull, dry skin and reveal a gorgeous glow. Triple moisture body lotion ($12): This ultra-hydrating body lotion contains a sensual blend of coconut oil, shea butter, and aloe vera. It absorbs quickly and restores the skin’s natural moisture balance, leaving it soft, smooth and silky. The best-selling Cake Beauty brand emphasizes gourmand scents, luxurious textures and multi-purpose product offerings. Infused with 90 to 95 percent raw and natural ingredients, Cake Beauty products are nourishing, results-oriented and free of Parabens, sodium chloride, phthalates, sodium lauryl sulfate, GMOs, mineral oil, petrolatum, gluten & triclosan. be Delectable is now available at Kohl’s stores nationwide.